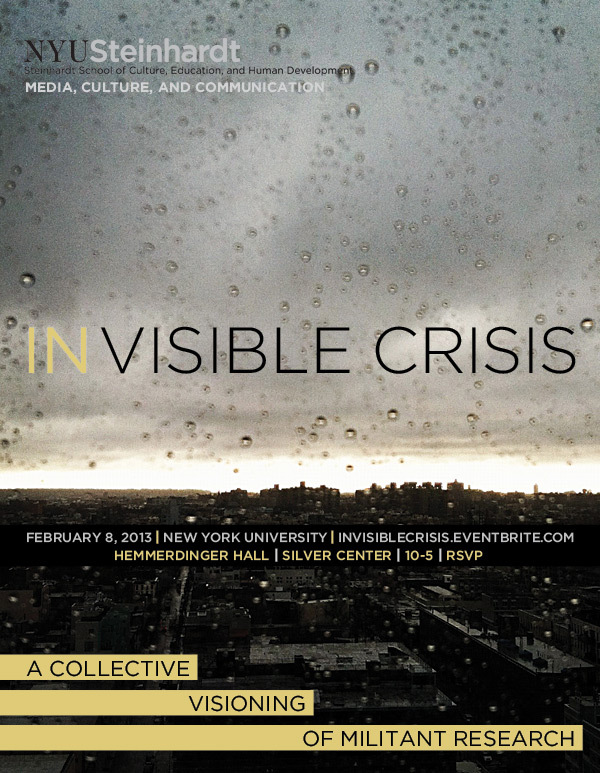 I spent last weekend attending two conference-like events, Invisible Crisis at NYU and the Fembot Unconference at University of Oregon. The fact of the University affiliation (and support) of these non-academic, or anti-academic, or quasi-academic events is now noted, and will be discussed soon; while the fact that they were on two sides of this country, one challenged by a blizzard, will be left better not dwelt upon. However, I will note that a curiously unexpected result of my and our increasing visibility and volubility online is that I am now asked to move my body offline—by airplane, cab, and foot—in increasingly intense and unnatural ways. In both cases, a collective (Occupy NY/Fembot) brought people in from out of town and even out of country (at real cost), so as to dialogue with the local community and stretch its capacities and conversations. While the Internet serves this purpose fine, we all also know, and I will further attest after getting my tired body to two places through a blizzard, that meeting in person is more effective, exciting, and enabling then connecting online. And this was decidedly the case with the Occupiers and other “militant researchers” (this was the term we were attempting to understand together) I met in NY. Like you, I’ve read a ton about Occupy Wall Street, and all the press waxes poetic about the force of these people, their intelligence and vibrant energy: all true! But this is not something you can be fully taken over by via reportage, or admittedly, even video alone. It was quite moving to be in the grace of their zeal. The Fembot meeting had another energy. Places and people matter! This was a group of hard-working, devoted, and warm feminists from Oregon. Equally smart and committed, the room felt less electric then it did collective. Affect matters. In both venues, conversation often found us valuing community over networks, even as both of these projects rely heavily upon networked technologies to build said communities. The hard and slow work of being and knowing together trumps the glib ease of ready techno-connection. It is more giving, sustaining, and satisfying. It may also be more powerful. In both venues, people wanted to understand the place of academia within larger movements or activities for social change (while Occupy WS seems to be uncertain whether they want to be a movement—”a thing versus a verb”—feminism can not be said to even be a movement at the moment. Occupy WS has a new, on the ground movement, now working on a project called Strike/Debt, by the way). The NYU event (thanks to Nick Mirzoeff and his team) successfully pulled off the extremely uncommon coupling of a large number of professors, students, and activists within an academic space, trying to speak to each other, so as to better understand the connections between us. This is extremely hard work given that it is based upon pushing both academics and activists outside of comfort zones of discourse, place, and operating procedures (something I tried to think through in the anti-war documentary project I made with my amazing activist sister, Antonia Juhasz). The presentation by Isidro Lopez (Observatorio Metropolitano, Madrid) about their Militant Research was inspiring in this regard. In Madrid, researchers from academia and elsewhere study their city and feed this analysis to the movement, often upon the movement’s request. Like Madrid, academia should and can have an on the ground movement of professors and students engaged in researching and organizing about our own conditions of labor. This is “militant research” with a different feel, function, and place, and this is Fembot’s core project: creating an online feminist space for research, publication, sharing, community, and mentoring around technology and media. While I am committed to direct action on the streets for those demands that require it, I want to here paraphrase Nitasha Dillon from Occupy Theory (a collective that produces the terrific journal, Tidal): education is direct action; just as we want education in direct action. Here, I point to the NY presentation of Kara Keeling who reminded us that we disregard the work of theory (and other forms of abstraction, like feminist, queer, or Afro-Futurist sci fi), to our own peril. Movements need our places of anticipatory investigation, plaintive desiring, and shared imagining—research aimed not at direct action but at the direct pulses of our hearts and brains—just as we do the protests such “research” can embolden. The academy is one of a few places in this, or any society, that might still support our abstraction work, and this is something to fight for. Sarah Kember, in Oregon, asked us to think through how we might best “exploit the contradictions of neo-liberalism,” including the fact that as academics (albeit, those of us with tenure comprising a different 1%) we have access to resources, platforms, and communities of great value to movements. Our (feminist) structure, legitimacy, and power, running as it does outside (or alongside?) the corporate, can be a real source of support to the movements we link to, and the movements we create within academia. If movements are verbs and not things, and militancy takes many forms, including but not limited to on-the-street activism and productive community-making, our research, as scholars inside and outside the university, creates both the ideas and the methods whereby we work within our own lived communities (and their networked affiliates) to exemplify how we want to live, together. This is a one-day participation event, bringing together teams of activists, artists and academics from Los Angeles and New York. The goal is to set a collective agenda for militant research practice in the year ahead. Militant research is research carried out with social movements to think about social change. So it questions the nature, practice, formats and outcomes of research. We hope to merge ongoing and new projects into a collaborative, rolling project of mutual aid. The global financial “crisis” is already five years old, perhaps permanent. In its name, all other issues must disappear. How can we visualize the crisis of the 99%, from personal debt to the climate, and recovery from disasters like Fukushima and Sandy? What still remains out of sight, whether concealed or overlooked? Three workshops will set these questions into specific contexts. One will be co-ordinated by the group from Los Angeles and another by their counterparts in New York. The final session centers on organizing from the local to national and international levels.